Venkataraman Ganesh, the SLC Speaker, writes about SLC’s trip to the Indian Parliament in the first week of December: from how the idea came about, the arduous process of bringing it to fruition, and details about their meetings with notable members of the Indian political spectrum, including top leaders and a Supreme Court Justice. Read on to get the whole story, including SLC’s takeaways from this experience. To be honest and give credit where it’s due, organizing a trip to the Indian Parliament was not my idea. In fact, when Ankit Jain, one of my opponents in the Speaker elections proposed a trip to the Indian Parliament in his manifesto, I laughed and tried to grill him on the particulars during our soapbox. How are you going to get the permission? Where are you going to get the money? When are you going to organize the trip? Where will people stay? These questions and more came to haunt me some three months later when I decided to try my hand at fulfilling Ankit’s manifesto point. The student governance structure in our institute can easily be stated to be the one thing that sets us apart from other colleges. Few colleges in India offer the freedom that insti does to its students; fewer still allow students to democratically elect representatives to handle nearly every aspect of student life. Rather unfortunately however, the interest amongst the General Student Body on matters related to student governance is abysmal – rather than looking at democracy and politics as a continuous process, most of us think of democracy and politics as that one time in March when we cast our vote. Reviving interest amongst the GSB about student governance and the Student Legislative Council has hence been of prime importance for this year’s elected representatives and when analyzing the different options available to achieve the same, I realized that a visit to the Indian Parliament could be a small step towards this. What can be more inspiring than watching our democracy function in person and what could be better way to know about politics and governance than by hearing it from our MPs and Ministers? Planning for a trip to the Winter Session of the Parliament started sometime in September. Broaching the idea to SLC’s faculty advisor, Prof. Sudarsan, was infinitely peaceful – Prof. Sudarsan supported the idea through and through and promised to use his contacts to see if permission could be obtained to visit the Parliament. In the meanwhile, I tried out the most straightforward way possible to obtain permission – I called the Lok Sabha Speaker’s office. Many emails and phone calls later, the trip was nowhere close to fruition – it was mid October and nothing seemed to be happening. It was at this point of time that Mr. K Srinivasan, Prof. Sudarsan’s friend, helped us out by providing the contact of a high ranking official in the Lok Sabha secretariat, who in turn put us in touch with the Bureau of Parliamentary Studies and Training. I mailed BPST on the 1st of November and expected a speedy response – the response finally came through on the 15th of November, inviting us to visit the parliament on the 30th of November. That, if nothing else, signalled that I would screw up my end-semesters! Planning the trip was hectic and painful. Despite unequivocal support from Prof. Sivakumar, our Dean (Students) and Swaminathan sir, the Dean’s secretary, the plan ran into one roadblock after another. Being over-ambitious, I thought it would be a good idea to take a 70-member delegation on the trip and sent off a mail to the GSB. At max, I expected around 100 students to respond, taking into consideration the fact that it was end-semester time. However, I ended up receiving nearly thrice as many applications. Blind reviewing the near 300 SoPs that students had sent in was painful; shortlisting 70 was worse. Furthermore, I thought it would be cool if I could book one railway coach for all 70 students, but that plan failed to lift off the ground – our institute’s travel agency outrightly stated that they cannot book bulk tickets and contacting the station master at the Chennai Central proved to be pain max. 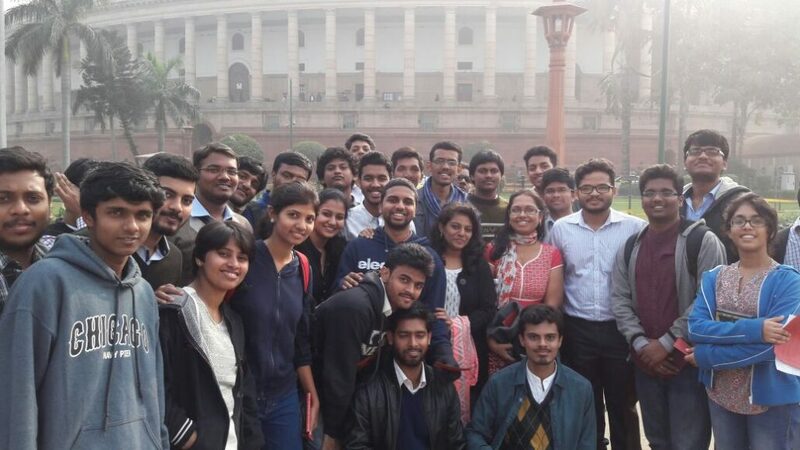 In the end, forced to concede defeat, I requested students to book their own tickets and promised reimbursements. Accommodation proved to be another headache. Swaminathan sir had contacted IIT Delhi to request for accommodation and he let me know that accommodation looked kind-of shaky. News that we might have to stay in IIT Delhi common rooms made me make a desperate bid to find accommodation in places ranging from the International Youth Hostel to Andhra Bhavan – these plans, however, fell flat. Thankfully though, IIT Delhi got back by the 25th of November promising proper accommodation. In the middle of all of this, my exams happened, one bad dream after another. Mailing MPs and requesting them to devote time to meet us proved to be another headache. Having a good line-up of MPs meant a lot to me – it was through them that I hoped to get more students interested into student governance and politics. To my horror, some of the MPs that I had banked on suddenly went AWOL – I couldn’t reach them at all. Carefully constructed itineraries collapsed with barely a week to the start of the journey, and in desperation I turned to Prof. Bhaskar Ramamurthy, our Director, with an audacious plan to seek his help to meet the Prime Minister. Prof. Bhaskar, however, advised me to write to the Minister for Human Resource Development. Seeking to meet the Minister and then trying to get an appointment to meet the PM through him as suggested by our Director seemed a better idea. Response from the Ministry, however, was again delayed (though in hindsight, I think it was more of a communications cup between the Director’s email ID and mine). At 10 pm on the 28th of November, as the Tamil Nadu Express left Chennai Central, all I had to look forward to was just one confirmed meeting with Dr. Anbumani Ramdoss. Things have a way of falling into place at the last moment though. Through the patchy data that my institute sim provided, I received a mail from Mr. Baijayant “Jay” Panda’s office and Dr. Shashi Tharoor’s office with directions to meet them on the 1st of December. As the train traversed through Maharashtra, I got a call from MHRD stating that a meeting with the Minister had been confirmed for the 2nd of December. Suddenly, the itinerary didn’t look so bad. The plan seemed to be on track, and I went to sleep that night much relieved and happy. Obviously, lady luck didn’t like that. I woke up to heavy fog, intense cold and an announcement that the train was running five hours late. Our visit was scheduled for 1:30 pm on the 30th of November and at 7:00 am that day, I woke up to the news that our train was delayed by 5 hours due to Delhi’s seasonal fog. That proved to be a disaster – upon calling the point of contact at BPST, I was informed we would not be allowed to deposit our luggage at the reception. That left us with no choice but to rush all the way to IIT Delhi and return immediately. We arrived at New Delhi Railway Station at 12:00 pm, and by the time we deposited our luggage and turned back to reach the Parliament, it was 4:00 pm, both the houses had been adjourned for the day, and the Parliament Museum had closed. Our late arrival had messed up our plans and we were utterly disappointed by the time we came out of the Museum, having seen nothing, and BPST rather regretfully didn’t do much to help. The day didn’t end on a sour note though. That evening, we had our scheduled meeting with Dr. Anbumani Ramadoss, the MP of Dharmapuri, Tamil Nadu. A former Union Health Minister and PMK’s Chief Ministerial candidate for the 2016 Tamil Nadu Assembly Elections, Dr. Ramadoss has several unique distinctions to his name (check out his Wiki page here) and meeting him was one of the high points of the trip. 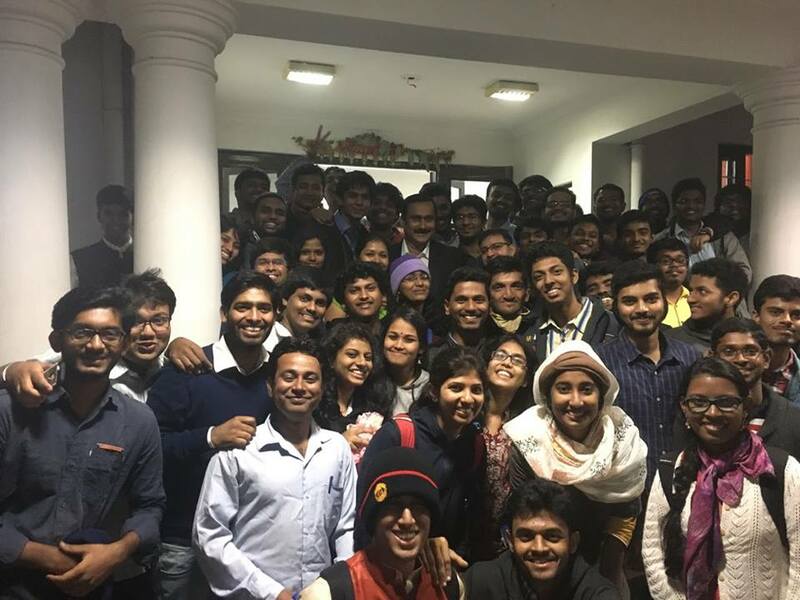 We met him at his official residence at 6:00 pm, and for the next two and a half hours, Dr. Anbumani Ramadoss delighted students by answering all types of questions on topics ranging from health to politics. From his support to prohibition to talking about how he manages political compulsion with his progressive development agenda, Dr. Anbumani Ramadoss patiently answered and explained the rationale behind his ideas and thinking. In fact, students were loathe to leave the meeting despite it becoming late in the night – in the end, it was the threat of having to miss the last metro to IIT Delhi that got people to finally stop asking questions. It must be mentioned here that Dr. Ramadoss was the kindest host we had in Delhi – after fielding questions for more than two hours, he had his cars drop us over at Andhra Bhavan and treated 57 of us to meals there. Post by Dr. Ramadoss can be found here. Day 2 saw us wake up to a thick fog that made taking a bath a painful prospect. Hot water provided by geysers proved to be insufficient in preventing one from shivering in the cold but one way or the other, all of us managed to be up on time – our first meeting for the day was with Mr. Baijayant Panda, the MP of Kendrapara, Odissa. A veteran MP (he has served in the Rajya Sabha from 2000-2009 and in the Lok Sabha from 2009-Present), Mr. Baijayant Panda is well known for his knowledge and the many private member bills that he has tabled in the Parliament. As an engineer who has studied in the Massachusetts Institute of Technology, I expected Mr. Panda to dwell a lot on what engineers could do to help MPs in developing their constituencies. To my surprise, however, what transpired was a discussion on political reforms! Reaching his residence at 10 am in the morning, we were greeted with cups of Nescafe Coffee and biscuits and Mr. Panda spoke on, and fielded questions from, topics ranging from the anti-defection law to the whip system. One message that Mr. Panda wished to convey to everyone was the role that students could play to make our country a better place. Mr. Panda urged students to adopt a cause – literally anything that they felt strongly and passionately about – and spend half an hour every week working towards it. Despite it being a short session (he had to leave at 11:00 am to attend the Parliament), it proved to be a very fruitful one. Personally, what impressed me the most was the small team of consultants that Mr. Panda had hired to help him with his work – be it parliamentary research or constituency development. That is a system that other MPs should try and emulate in my opinion. Post by Mr. Panda can be found here. The next meeting was scheduled only at 5:00 pm at the International Youth Hostel Conference Room – in spite of an extremely packed schedule, Dr. Shashi Tharoor had agreed to interact with us for some time. The disappointment of not being able to visit the Parliament was still palpable though, and I had asked Mr. Panda’s office if they could arrange for passes for all of us. To my pleasant surprise, within 15 minutes of us leaving his house, I got a call from his office asking me to send over an excel sheet with our details! Surprises did not end there though – I had just managed to mail the details over to Mr. Panda’s office (after putting a lot of fight to find a cyber cafe in Connaught Place I may add) when at around 1 pm in the afternoon, an official from MHRD called up and directed me to meet him at Shaastri Bhawan. Our Director had somehow put in a word and had asked MHRD to arrange for a visit to the Parliament on Friday in addition to meeting with the Minister! Mr. Kundan Nath, the officer who had called me up, proved to be a very nice man – after introducing us (Raghav had decided to give me company) to his boss and ensuring that I was indeed I (by making me talk to the DoSt over phone), Mr. Kundan Nath informed us that we were to meet Mr. Prakash Javadekar within the Parliament’s precincts at 10 am the next day. This was to be followed by us watching the proceedings of the Rajya Sabha and meeting with the Secretary-General of the Rajya Sabha Secretariat – Mr. Shumsher Sheriff, the Secretary-General, was to explain how the Parliament worked to us! Buoyed by this sudden turn in fortunes, Raghav and I rushed to the Youth Hostel to meet Dr. Tharoor. Dr. Tharoor turned up as promised and the first thing that I noticed about him was the very refined manner in which he carried himself. This was not really surprising – Dr. Tharoor had served as Under-Secretary General in the United Nations and had in fact competed against Mr. Ban Ki Moon to become the Secretary General of the United Nations. On his return to India, Dr. Tharoor joined the Congress and was elected as Member of Parliament from Thiruvananthapuram, Kerala – a designation he still holds. 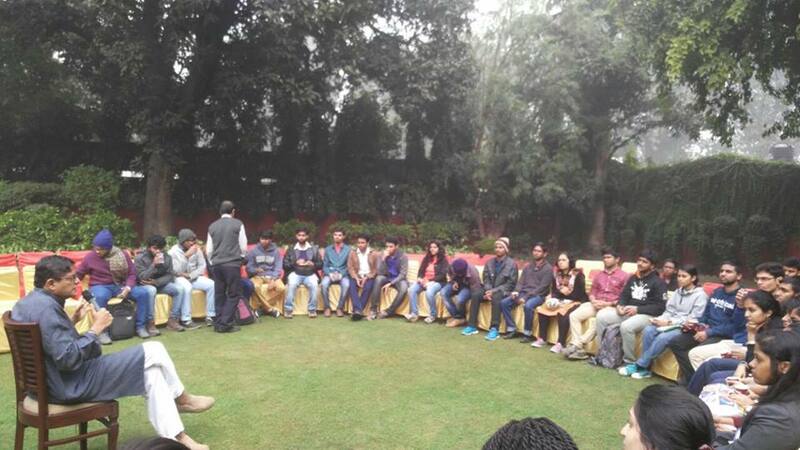 The interactive session with Dr. Tharoor was very well received by the students. Colonialism, liberalism, Rajaji and political reforms all came together in a potpourri that blew students away. 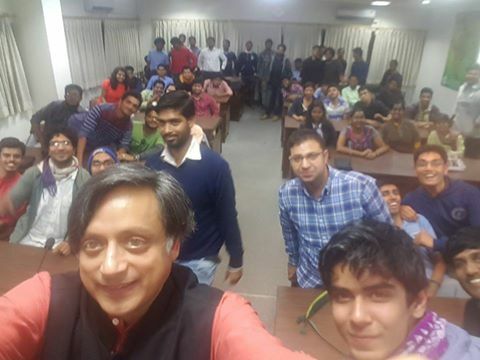 There was more to come though – as the session wound to an end, Dr. Tharoor very graciously agreed to take a selfie with us! Day 2 officially ended with the meeting with Dr. Tharoor – but a few students and I had planned for a small digression in the plan – we had arranged for a meeting with the student representatives of the JNU Student Union. Post by Dr. Tharoor can be found here. Click to go on to the next page.